The Skinny: How to Fit Into Your Little Black Dress Forever by Melissa Clark and Robin Aronson was written to help women to ‘look and feel fabulous without denying yourself the pleasure of great food’. When health writer Aronson wanted to lose the 20 extra pounds that she gained after giving birth to twins she enlisted the help of her slender friend and food writer Clark. Clark was overweight until the age of 23 when she developed a system to control her weight and now she manages to eat out at restaurants in New York almost every night while retaining her slim figure. Following Clark’s advice Aronson lost 30 pounds, which attracted the interest of her friends who all wanted to know her weight loss secrets. This prompted Clark and Aronson to package their weight loss strategies into a book so that other women could benefit from their experience. The authors emphasize the importance of striking a balance between being ‘a little good, a little naughty, and a lot happy’. They say that this is the best way to enjoy food without guilt and without sabotaging weight loss. The major principle of the diet is about learning to eat the foods you love in small portions and balancing indulgences with healthy foods. The authors offer advice to help dieters to become satisfied with smaller portions and to learn what it feels like to be full. There is no calorie counting and no foods are strictly forbidden, however, there are limits on the amount of high calorie foods to be eaten. The authors advise dieters to satisfy their cravings with a few bites of a rich food and then to fill up on fruit and vegetables. Eat small portions of fried or high calorie foods. Eat moderate portions of foods such as grilled chicken or sashimi. Add a small serving of complex carbohydrates such as a whole grain roll to balance out the meal. Always include a small amount of protein in each meal. Fruit and vegetables, lean proteins, whole grains. Dieters are advised to exercise for 30 minutes, three times a week. 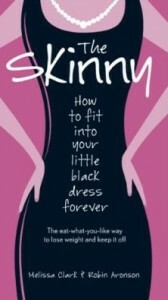 The Skinny: How to Fit Into Your Little Black Dress Forever retails at $14.50. Teaches dieters the principle of portion control. Provides information regarding how to select the best beverages for weight management. Some dieters may not be able to restrain themselves with just a few bits of their favorite foods. The amount of exercise recommended is probably insufficient for weight loss. Male readers will not relate to the authors writing style and some of the recommendations. Advice to throw food away after a few bites is wasteful. The Skinny arms dieters with a range of practical tips and strategies to reduce portion sizes and calorie intake without having to follow a structured diet plan or go without indulging in favorite foods. It will appeal to dieters who eat out a lot and don’t want to make a dramatic adjustment in their lifestyle. p.s. make that ‘check with your MD first’. sorry- got so carried away in my praise of this diet that i didn’t catch my typo!! happy eating the scarsdale way! ! ! ! !